Can SMBs Recover from IT Mishaps? The short answer is ‘yes.’ The long answer is ‘IT data recovery’ is a complicated and sometimes costly experience. It happens in various ways, and many larger brands mandate a required number of daily off-site backups, separate from Cloud storage. For SMBs, it just takes being vigilante about maintaining a standard of IT best practices, as well as contracting with fully vetted 3rd party vendors. Rating your data . . .
What’s important to you? What IT infractions can you incur and still be in a position run your company adequately? Once you’ve answered those questions to your satisfaction, you’re ready to move on to the higher priority items and how to secure your company in case of mishaps. Recovery point objectives or RPOs are elements pertaining to loss and recovery time objectives [RTO] is the point that determines how long it takes for an RPO workload to get back online? If you can’t afford a full-blown IT staff and your currently familiar with Microsoft suite of products, you should consider the firm’s Azure Site Recovery for ease of use. It’s pretty much top-of-line for SMBs and competes heavily in encryption market. Other companies to consider include Unitrends and Barracuda,which both sell backup appliances that can transmit your backups to the Cloud. Veeam, on the other hand is probably a step up from the other two, as it also offers a multi-service provider public cloud mode. When the Real World is not secure . . . The same data depending on different situations may create different values for your SMB. From a production standpoint, losing 24 hours worth of accounting info might not be an issue if you’ve maintained a sufficient paper trail. However the real world is subject to real disaster – fires, for instance could destroy all of your back-up within seconds. In those cases, again using one of the security software packages mentioned above can get you back to pre-fire status, in less than a day’s time, in most case scenarios. 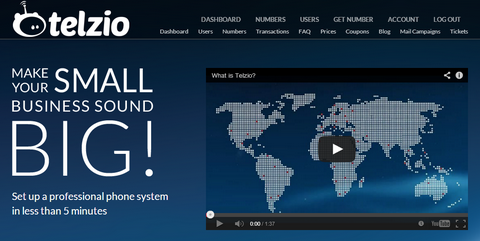 VoIP your data . . . Disaster recovery software however doesn’t remove the requirement for various layers of internal and external backups. Backups exist not just to deal with the building burning down, but also with someone accidentally deleting something they shouldn’t have. So transfers are a serious consideration. Here you might think about a ‘hybrid cloud backup’ solution, with a dedicated line. If an SMB is still using a landline, an asymmetric digital subscriber [ADSL] line will allow data to be sent over existing copper telephone [POTS] at higher bandwidth and speed. With a VoIP system, which also works over ADSL, companies can use the Internet for these transfers at less cost. Telzio has taken the necessary precautions . . . In talking to Telzio’s CEO and founder, Peter Rank Schrøder today, their VoIP service company has not only taken the necessary steps to protect their company’s data from IT threats, they’re also providing their customers with ease of mind when they contract their services. In preventing downtime, “we maintain ‘mirrored servers,’ which means we have identical machines running identical tasks in different locations . . . so, if one server crashes, the other simply takes over,” notes Schrøder. At end of day . . .
It’s extremely important that SMBs review their backup and data recovery processes and take business continuity seriously. Given the vulnerabilities associated with data security and workforce mobility, the risk of critical data loss today is evident and firms of all size must be truly prepared for the unexpected.